Outdoor Kitchens have an incredible appeal in Arizona. And why not, with our incredible year-round sun and warm weather? The winter can be the best time to get outdoors and invite friends to watch the big game over a BBQ meal! No need to run back and forth to the house. Adding an outdoor kitchen in Scottsdale, AZ makes your home feel like you've added a whole new living space. An outdoor kitchen can be anything from installing a built-in barbecue and counter space with decorative pavers or tile, to a full blown kitchen and dining room. A pizza over - Pizza ovens are not much different from installing an outdoor fireplace. They include a metal rack above an open area where you build a fire. Have fun playing around with the right size of fire to get just the right crispy crust on your pizza! Dining area - Installing a breakfast bar next to your barbecue with just the right decorative stools might be just the touch you're looking for. If you have a large family or host large gatherings, consider a large farm-style table. The rustic look will fit right in, in the outdoors. Or, go even further and bring in a cozy outdoor living room set complete with comfy couches and chairs surrounding a coffee table. Full service outdoor kitchen - Having a refrigerator and range outside, as well as ample counter space, does more than create an outdoor kitchen. It creates the new favorite gathering space for our family and friends. With a full-service kitchen you will find yourself outdoors and taking in the vitamin-D with frequency. Outdoor bar - Having an outdoor bar with the right ambiance instantly makes your home the go-to place for parties or to watch the game. You score even higher with friends if you have a swim-up bar next to the pool! A mini-fridge to enjoy a cool beverage on a hot day hits the spot! Customer Frame Structures - Shade structures vary from something as simple as four decorative poles with a gauzy material strung over them, to a complete open-air room. Providing some kind of shade to your outdoor kitchen in Scottsdale, Arizona is a must! You instantly add several more months of usage you would not have otherwise. Finding ways to add decorative flare to your Scottsdale outdoor kitchen can come in many forms. Outdoor lighting creates a mood and makes your outdoor kitchen functional at night. You can also use lighting to highlight focal points in your landscaping. From there, bring in more of your senses by adding a water feature. You get the sound of the water falling over rocks or into a pool and the visual beauty of the water highlighted by back-lighting. That is the perfect recipe for a calming space to unwind in the evenings. The crackle of a fire feature doubles as a spot to gather, as well as a place to stay warm when the evening temperature cools. 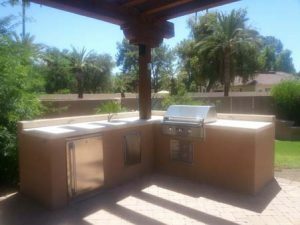 For more ideas on how you can enhance your home with an outdoor kitchen in Scottsdale, AZ, contact us at Desert Environments. 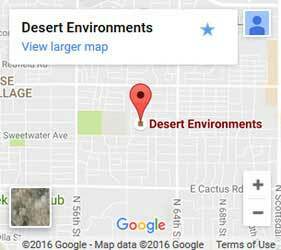 Our landscaping contractors are happy to visit your Scottsdale home for free and discuss the many options available.